The new Cayman aims once more to set the class benchmark for driving performance, its longer wheelbase, all-new chassis and lower weight further optimising the established dynamic credentials of the mid-engined sports coupe. Since its debut in 2005, the Cayman has earned a particular reputation as a driver's car. For the latest model, the two-seater has been newly-developed from the ground up and - after the 911 Carrera and Boxster roadster - is the third sports car model series from Porsche to feature innovative lightweight body design. Consequently, the new Cayman is up to 30 kg lighter than the prior model, depending on the specific version and equipment, and offers up to 15 per cent greater fuel efficiency- despite its increased engine output and driving performance. The new Cayman is more distinctive than ever. Its proportions are new, and yet it is clearly a Porsche sports coupe; an extended wheelbase with shorter overhangs and 18- or 19-inch diameter wheels with larger rolling circumference are identifying visual characteristics of the car's more enhanced driving performance. Its styling is marked by precise lines and razor-sharp sculpted edges. They emphasise the car's low, extended silhouette with the windscreen shifted forward and the roof line that reaches far back. Typical of the more advanced styling is the shoulder line, which runs from the wheel arches, flaring strongly upwards towards the rear side panels. The door mirrors are now positioned near the top shoulder. Especially expressive and characteristic are the dynamic recesses in the doors, which guide induction air into the distinctive scoops on the rear side panels and from there directly to the engine. These offer the most prominent visual signal of the car's mid-engined layout. From the front, the new Cayman is marked by its dominant cooling air intakes, which increase in size towards the sides of the car. Integrated into these, far outboard, are the round front lights with four-point daytime running lights or position lights, serving as a further unmistakable identifying feature of the new Cayman. Just as unique to the new generation of the sports coupe is the rear boot-lid made of aluminium and the rear section with its wrap-around edges. At the upper edge of the rear window, an LED brake light spanning the entire width of the glass is easily spotted by traffic behind. Mounted directly to the tailgate is the thin blade of the rear spoiler, which - in contrast to that of the Boxster - is higher and deploys at a steeper angle. The overall appearance of the Cayman is more independent than before, offering greater differentiation compared with the previous model. Porsche offers two exceptional flat six 'boxer' engines in the Cayman, a 2.7-litre and 3.4-litre, which both combine ample torque with high power in the upper engine rev range. One consequence of this high-revving concept is that although the 2.7-litre has a 0.2-litre reduction in engine displacement compared with the previous 2.9-litre unit, it still develops a higher power output. With its specific power of 101.6 hp/litre, the 2.7-litre engine is the first Cayman to break the magic 100 hp per litre displacement barrier for sports car engines. Both engines now produce their maximum nominal power at 7,400 rpm; it was 7,200 rpm previously. Not only were peak powers increased by 10 hp to 275 hp (202 kW) in the Cayman and by five hp to 325 hp (239 kW) in the S-model; their two power curves also lie above those of the previous engines, which means that overall the six-cylinder engines produce more power at identical engine revs. The new engines draw their air from both the left and right air scoops. In the 3.4-litre six-cylinder engine of the Cayman S, a switching resonance flap improves cylinder fill, providing high torque at low revs as well as a uniform torque curve. Both engines feature variable valve timing and lift (VarioCam Plus) on the intake side for optimal timing in charge changes. Cayman 2.7-litre flat-six cylinder engine with 275 hp (202 kW); rear-wheel drive, six-speed manual transmission, optional seven-speed Porsche Doppelkupplungsgetriebe (PDK); acceleration 0 - 62 mph 5.7 sec, with PDK in 5.6 sec (5.4 sec with Sport Chrono package); top speed 165 mph, with PDK 164 mph; fuel consumption (NEDC) 34.4 mpg, CO2 192 g/km; with PDK 36.7 mpg, CO2 180 g/km. Cayman S 3.4-litre flat-six cylinder engine with 325 hp (239 kW); rear-wheel drive, six-speed manual transmission, optional seven-speed Porsche Doppelkupplungsgetriebe (PDK); acceleration 0 - 62 mph 5.0 sec, with PDK 4.9 sec (4.7 sec with Sport Chrono package); top speed 176 mph, with PDK 174 mph; fuel consumption (NEDC) 32.1 mpg, CO2 206 g/km; with PDK 35.3 mpg, CO2 188 g/km. The flat-six cylinder engines -- positioned in front of the rear axle -- make these two-seater Porsche sports cars prime examples of efficient performance. The engines of both models are up to 15 per cent more fuel-efficient due to petrol direct injection, thermal management, electrical system recuperation and auto start/stop function. Key components for improving efficiency are electrical system recuperation and map-controlled thermal management of engine cooling. In electrical system recuperation, the battery is charged more intensively during braking and coasting phases. In turn, alternator charge current can be reduced when the battery is fully charged. This reduces the load on the internal combustion engine in acceleration phases, because it does not need to produce as much power to charge the battery. Thanks to intelligent control of the combined engine and transmission cooling systems, both engines reach their operating temperatures more rapidly, which results in better combustion under part-load with less friction. In conjunction with the optional Porsche Doppelkupplungsgetriebe (PDK) transmission, the new Cayman shares a feature with the Boxster and the 911 Carrera that follows the principle of generating engine power only when it is actually needed: the coasting function. The coasting function enables decoupled coasting, in which the engine runs in neutral with low fuel consumption. In practice, this can result in optimal savings of up to one litre of fuel per 100 km. The new Cayman employs a six-speed manual transmission as standard; its gear ratios are optimally chosen for the engine's unique characteristics. The double clutch PDK is also available as an option. It offers seven gears and shifting without any interruption in propulsive power, and it enables faster sprints and better fuel economy. The Cayman also now offers a Sport button as standard that lets the driver choose between sport-oriented tuning and that which is optimised for fuel efficiency. In Sport mode, the electronic engine management system makes the engine respond even quicker, with more direct dynamic response of the engine. In vehicles with PDK, automatic mode results in later upshifts and earlier downshifts. Moreover, the start/stop function and coasting function are deactivated. The PDK is precisely tuned to the vehicle dynamics of the new Cayman. For example, in manual mode it enables controlled drifts with the Porsche Stability Management (PSM) deactivated - assuming a suitably protected roadway. Detection of the yaw angle and steering input angle initiates prevention of upshifting and permits a specific dynamic driving style. The Sport Chrono package delivers the best possible standing-start acceleration in conjunction with PDK and the Sport Plus button with the Launch Control function. This shortens the sprint from 0 - 62 mph by 0.2 sec compared with normal mode. The Sport Plus button also activates the PDK 'race course' shifting strategy. For even better driving performance and ride comfort, the Sport Chrono package incorporates dynamic transmission mounts. These alter their stiffness and damping rates as a function of the specific driving situation. With a hard setting of the mounts, for example, the drivetrain's moment of inertia is significantly reduced when steering into a bend and on quickly alternating twisty roads, which minimises rear body press. Its effects are similar to those of motorsport track cars, in which the engine is directly mounted to the body, resulting in more stable and precise handling. The driving performance of the Porsche Cayman is extraordinary. More than ever, the interplay of the mid-engine concept and chassis tuning assures it a top position in its class. The fundamental geometry creates ideal conditions for this performance: a 60 mm longer wheelbase for greater stability at very high speeds, a wide track width at both axles for additional driving stability and cornering agility and larger diameter tyres for even better road grip up to the limits of performance. Porsche engineers placed a high priority on tuning the Cayman chassis, but not only with the goal of improving driving performance and agility -- they also wanted to simultaneously improve comfort and everyday practicality. The new generation of the optional PASM active damping system further extends the driving performance range of the Cayman. The reason: four additional vertical sensors at the front and rear wheels enable even better and more finely tuned control. Optimally controlled damping improves the road grip, offering greater driving stability, more comfort, enhanced performance and shorter braking distances. Just as before, the driver can use the PASM chassis control button on the centre console to choose between the two modes 'Normal' and 'Sport'. The system also acts as a function of the specific driving situation, so that driving fun is not compromised: during smooth motorway driving, for example, only moderate damping forces are required. In a sporty style of driving, on the other hand, high damping forces improve road grip and car body control. Electro-mechanical power steering replaces the previous hydraulic system of the Cayman. Its high performance lets drivers experience the agility of the Cayman even more intensively. The driver receives direct feedback via the steering wheel, and negative or unnecessary "noise" is filtered out. At the same time, the new system offers fuel economy benefits while enhancing comfort and safety through auxiliary functions. Building upon the capabilities of the PASM chassis, the optional Porsche Torque Vectoring (PTV) system is able to increase the driving performance potential of the Cayman still further. PTV is the intelligent interaction between the rear differential lock with braking interventions on selected wheels, an added function of Porsche Stability Management (PSM). Essentially, PTV improves the vehicle's steering response and steering precision by targeted brake interventions at the rear wheel located on the inside of a bend. The braking torque is activated as soon as the steering wheel is turned. The results: improved performance in bends as the turn is initiated. The rear differential lock then significantly improves traction capabilities when accelerating out of the bend. Hand in hand with the car's enhanced driving performance, the brake system of the Cayman has also been made more powerful. Along with equipping the system with stiffer front brake callipers, optimised brake pad design and a larger brake contact surface, improvements were made in cooling the brake discs as well. Furthermore, the new Cayman S has larger front brake discs that originate from the 911 Carrera. To improve safety in traffic and provide a better warning to vehicles behind, the brake lights of all Cayman models pulsate as soon as ABS control is activated. As in previous models, the exceptionally high-performance Porsche Ceramic Composite Brake (PCCB) system is available as a motorsport-proven option. With this system, 350 mm diameter brake discs are used at the front and rear wheels of all models. The PCCB brake callipers are also painted yellow, and a new six-piston calliper from the 911 Carrera is used at the front wheels. The new Cayman models ride on wheels and tyres that are now one inch larger in diameter than on the previous model. Standard now are 18-inch wheels (Cayman) and 19-inch (Cayman S), which give the sports coupe increased lateral stability and handling properties. Optional wheels include 20-inch Carrera S design, 20-inch Carrera Classic with bi-colour styling and the new 20-inch Sport Techno rims from the Exclusive programme. The standard tyres are optimised for low rolling resistance, with a typically high level of Porsche performance in terms of handling and braking distance, and they are also low in weight. A seven per cent reduction in rolling resistance compared with the previous models contributes towards reducing fuel consumption. 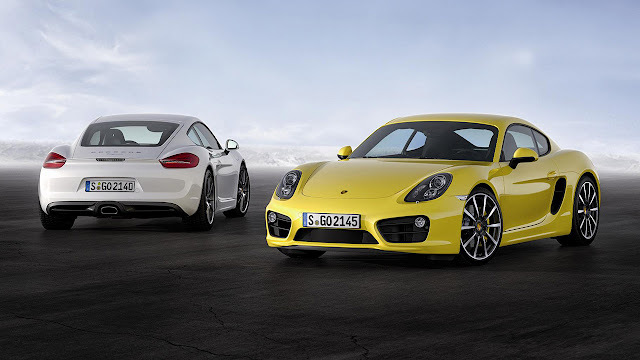 The body of the new Cayman is an entirely new development based on the body-in-white of the Boxster. The result is an innovative lightweight body design with mixed aluminium-steel construction that has reduced body-in-white weight by around 47 kg. At the same time, the car's static torsional rigidity has been boosted by 40 per cent. In other words, the Cayman drives more precisely than ever before. Extra features, larger glass surface area and larger wheels offset some of the weight savings, yet the DIN weight of the sports coupe is lighter than that of the previous model; for example, a standard Cayman S weighs 30 kg less than before. In its new lightweight body design, Porsche uses steel only where it is essential. On the other hand, wherever lightweight metals can be used, they are the preferred choice. For example, die-cast aluminium, aluminium sheet, magnesium and high-strength steels are used, and all materials are tailor-made for specific purposes in the body, ensuring very high rigidity values while minimising material usage. 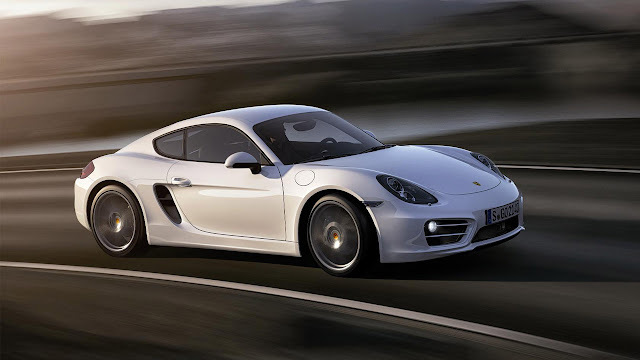 Around 44 per cent of the new Cayman body-in-white consists of aluminium, e.g. the front body, floor and rear body, the doors and the front and rear boot-lids. Compared with the previous model, aerodynamic lift has been further reduced at both axles, which leads to greater driving stability at high speeds. Among other features, a new front spoiler lip significantly reduces front axle lift. At the rear axle, the new wing combined with a spoiler lip running across the entire width also makes a crucial contribution towards reduced lift. The wing is optimally integrated in the rear body with a curved shape, and it can be deployed either automatically or manually. With its 40 per cent larger effective area, it generates more aerodynamic downforce than the spoiler of the previous model, and it offers less resistance to the air flow. The interior of the new Cayman continues the current trend established by current Porsche sports cars and adds significant appeal to the sports coupé. This also applies to its new optional features: for the first time, a high-end Burmester sound system can be ordered which is individually tuned for the Cayman. Another new and optional feature is Adaptive Cruise Control (ACC). A particular interior ambience is created by the optional bi-colour leather packages that can be delivered; the base colour Agate Grey may be combined with Lime Gold, Gravel Grey or Amber Orange. The centre console that ascends towards the front with its motorsport-inspired high-set gear lever gives the driver the feeling of being fully integrated with the car. Controls for key vehicle operation functions and settings are arranged in logical groupings on the centre console, laid out for quick and intuitive control of individual functions. indicator in the tachometer shows which gear is engaged, while the up-shifting recommendation in the instrument cluster is useful for when optimising fuel efficiency is the priority. The standard CDR audio system features a seven-inch touchscreen display that is centrally located further upwards and is easy to see and offers convenient access to many different functions. 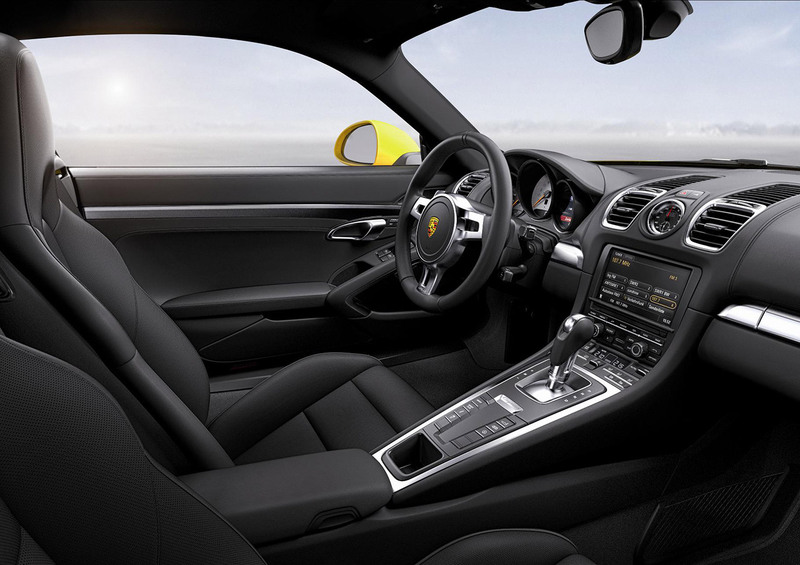 The three classic round instruments of the Cayman model series with a centrally positioned tachometer and an ignition switch to the left of the steering wheel (on left-hand drive models) make the connection to a familiar cockpit environment. New is the high-resolution 4.6-inch VGA multi-function screen on the right-hand side of the instruments. Along with the most important trip computer functions, it also includes a map display for the optional Porsche Communication Management system with satellite navigation module. The driver and passenger sit on new sport seats. These offer very good comfort for long-distance touring and excellent lateral support for a dynamic style of driving. The standard sport seats have mechanical fore-aft and height adjustments, and the backrests are electrically adjustable. The optional Sport Seat Plus system offers even greater lateral support with larger side panels on the seat cushions and backrests and more pronounced sculpting in the shoulder area. Electric sport seats and adaptive sport seats plus are also offered as options. The new extended silhouette of the Cayman also increases the practical virtues of the car: the larger rear boot-lid offers better access to that cargo area, and luggage capacity of the two-seater has been increased by 15 litres to 425 litres when loaded to the roof. An eye-catching feature that is revealed when the rear lid is opened is the new aluminium panel that extends across the engine compartment cover between the two filler caps for coolant and oil. A luggage partition bar that is also made of brushed aluminium spans the space behind the head restraints. The new top option among the sound systems on offer is a special made in Germany system that Porsche developed for the Cayman together with Burmester. Based on experience acquired from systems in the Panamera, Cayenne and 911 Carrera, this new system attains a total acoustic power and sound quality that are exceptional for the sports car segment. This is impressively demonstrated by the system's performance figures: twelve individually controlled loudspeakers, including an active 'body-in-white' subwoofer with a 140 mm diameter diaphragm and integrated 300 Watt Class-D amplifier, and twelve amplifier channels with a total output power of over 800 Watts. For Cayman models equipped with PDK, Porsche now offers a new upgrade option for driving convenience and safety: Adaptive Cruise Control (ACC) that includes the safety function Porsche Active Safe (PAS). ACC operation is based on a radar sensor located in the middle of the front body panel, which spots objects in the car's driving lane over a range of up to 200 metres. ACC maintains a speed-dependent distance to a vehicle ahead in traffic over four pre-selectable stages, and automatically adjusts driving speed up to a vehicle stop. This relieves the workload of drivers in dense, slow-moving traffic. PAS builds on this system and can help to avoid front-end collisions - even when ACC is switched off. It uses the front radar system to continually monitor traffic for much slower vehicles ahead. If the system detects an impending hazardous situation, the brake system is pre-conditioned, and the Brake Assistant is primed. If the situation becomes more critical, PAS outputs visual and acoustic warnings, and the driver is alerted to the need to intervene by a jolt in the brake pedal. If the driver does not react with appropriate braking, the system can increase braking pressure up to hard braking, depending on the situation.